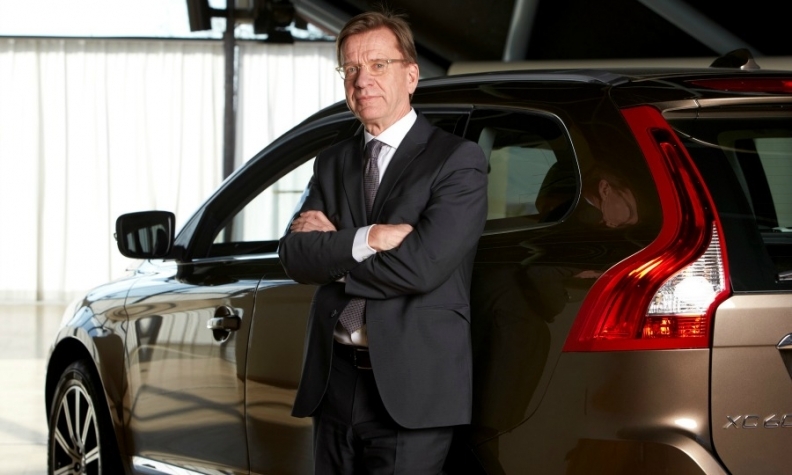 Volvo CEO predicts positive 2015 in Europe, U.S.
Hakan Samuelsson: "In Europe we plan to grow both in volume and in share" next year. Volvo CEO Hakan Samuelsson has helped turn around the Swedish automaker. Through nine months, Volvo’s global sales were up 9 percent to 339,200 vehicles. In addition, the brand is growing at a faster rate than BMW, Audi and Mercedes-Benz in Europe and China. Samuelsson expects Volvo’s rise to continue in 2015 as it rolls out the second-generation XC90, which is a key part of the automaker’s plan to boost annual global vehicle sales to 800,000 by 2020. Samuelsson spoke with Automotive News Europe Managing Editor Douglas A. Bolduc and Automotive News Reporter Diana T. Kurylko. What is the 2015 outlook for Volvo in Europe, the U.S. and China? We want to grow in all three areas. We may not grow in China at the same rate as 2014 [China sales were up 36 percent through three quarters], but we want to continue to grow significantly. In the U.S. we knew that this year would be challenging [nine-month sales were down 11 percent]. We will go down in volume, slightly, but we will grow next year predominantly driven by the XC90. We haven’t refined the volume target but next year should be a year of year-over-year growth in the U.S. In Europe we plan to grow both in volume and in share. Volvo’s European sales through September were up 12 percent, which is better than BMW, Audi and Mercedes. We are outperforming the three German premium manufacturers in Europe and in China. We are growing faster than them in Europe and in China. But this is because you’re starting from a lower base, right? It’s better than growing slower than the three. MAIN CHALLENGES: Maintaining Volvo's strong growth in Europe and China while ending sales declines in the U.S.
How long will it take Volvo to be one of the big five premium carmakers in the U.S., where the brand currently ranks 10th? Three to four years. It’s not done overnight. You have to grow in volume as well as customer satisfaction, brand awareness, everything. When that starts you begin an upward trajectory and then you can reach that target. Some automakers are scaling back production in Europe while Volvo is adding a third shift at your main plant in Sweden for the new XC90. Is Europe slowing again? Europe is a very tricky market. There are a lot of issues: Russia, Ukraine, the euro, southern Europe’s struggles and France’s slow growth. There are a lot of question marks, but compared with the last two or three years, when we had negative growth, I think we see a more stable market. Southern Europe is coming back. They are growing from a very low level but it’s still better than the red figures from before. How about Russia? After three quarters your sales were up in a market down by 13 percent. Will you have to pull back? We have not pulled back but the customers have pulled back. The market is down so that will influence us. We are holding our market share but shrinking with the market so it’s not the end of the world. Since you don’t build in Russia are you concerned the government might ban sales of imported cars in response to sanctions from the West because of the conflict in Ukraine? Yes, that could happen. I hope the Russians will think twice before they get into a trade war with the West. I hope that common sense will prevail. But we have to keep an eye on that. We can live with that decline in Russia [which accounts for about 3 percent of Volvo’s global sales]. But the important thing is whether this escalates in some way and impacts the economy in Europe. Then we are talking about something more severe. What kind of impact is the new-generation XC90 already making? It helps us even before we start selling it because suddenly, especially in the U.S., it says: “Hey, do you remember Volvo? We are still here.” That message will be sent out with the new car. Volvo is the first premium automaker to say it will ship China-built cars to the U.S. Why is that? All our factories are 100 percent Volvo. Everybody else has joint ventures. Are you planning to export China-made cars to Europe? A special-edition model would not be ruled out, but it’s not on the list right now.